DANVILLE, CA JANUARY 31, 2013 – Industry leading suspension manufacturer, Rubicon Express has announced it will be sponsoring professional off road racer, Jason Scherer. The new partnership brings together a company that pioneered modern high performance suspension systems for Jeeps with a championship winning driver and race team. Both Rubicon Express and Jason Scherer are based in Northern California with strong roots wheeling on the famous Rubicon Trail. As their newest ambassador, Scherer’s Ultra4 single seat race car will be wrapped with the very recognizable Rubicon Express black and silver logo which will be debuted at next weeks 2013 King of the Hammers and continue its appearances at the three Ultra4 Western Series races. Jason Scherer is a highly respected racer who has stood on the podium in many disciplines of racing including winning one of the most prestigious events, the 2009 King of the Hammers, making it four consecutive top 20 finishes. His consistency has earned him multiple Pro-Rock Championships and a nomination for Dirt Sports “Driver of the Year” award two years in a row. “I work hard to be the best driver that I can be, between being in good physical condition and understanding my vehicle limits. I have learned the pace that I can stay fast and not risk failure,” said Scherer. “I am very excited to join into this partnership with Rubicon Express. It’s truly a natural fit for both of us and I am glad to represent a professional group that has it’s roots in the Rubicon, one of my favorite places. Scherer’s race car is currently on the lakebed and in great condition. “This car is amazing,” said Scherer. There were a few big adjustments made to the car for the 2013 season, but the Nitto Tires and Spidertrax components are still highlights of this single seat IFS car. “I know what I need to do to win, now it’s time to execute!,” said Scherer. RUBICON EXPRESS was founded in 1996. The company is staffed by a team of dedicated off-roaders, with the goal to provide Jeep enthusiasts with the highest quality suspension components at the greatest value possible. After more than 15 years of doing business, Rubicon Express is the industry standard in after-market Jeep suspension and drive-train products. 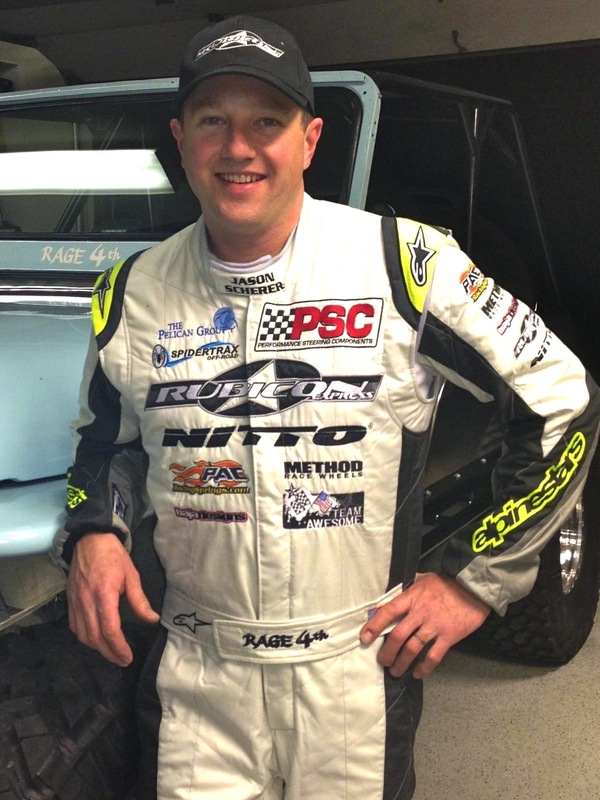 More about Jason Scherer: Jason Scherer has been racing for over 15 years and has stood on the podium at many events winning one of the most prestigious events: The 2009 King of the Hammers. He also has a third place finish in 2011 and won the 2012 Nitto National Championship Race in Blackwell Texas. His consistency and race car set-up is also proven winning the Pro-Rock Championship in 2006, repeating in 2007. Jason’s growing list of high profile finishes have earned him the honor of being nominated for Dirt Sports “Driver of the Year” award two years in a row. Scherer embraces his racing career with a very supportive wife and children who join him on the trails of Northern California in their 1972 Jeep CJ-6.